Energy and Industrial location (4Qs) done You’re HERE. Those who did not appear in UPSC Civil Service Mains 2013 exam, my advice is you first write above questions at home. Then check them with sample answers given below. Otherwise, merely reading the following article won’t help you master the answer writing skills. GS1: Syllabus topic: Distribution of key natural resources across the world (including South Asia and the Indian sub-continent). Since this is about current “policy”, those standard reference books are silent on it. When shale gas oil discovery in US hit the news lines, many articles published in news-papers in euphoria (2012 era). But then, The Energy resource Institute (TERI) published a document named “Look before you leap” -a policy brief on Shale gas exploration in July 2013. Natural gas trapped within shale formations. Like Coalbed methane (locked in coal seams), Shale gas is locked in rock formation. Colourless, odourless, lighter than air. What are the benefits of Shale gas? Gas based powerplants are cheaper than coal based thermal powerplants. Cheaper + clean = better than Nuclear and solar energy, which are quite expensive. Petrochemical industry can convert it into plastics, fertiliser and other useful stuff. Gas power stations are relatively cheap to build, beating nuclear power hands down in terms of capital costs, and in most cases they are also less expensive than renewables. Cambay Basin, Assam-Arakan, Gondwana, Krishna-Godavari basin, Kaveri basin and the Indo-Gangetic plain. While Shale gas offers a cheaper and cleaner fuel compared to coal and crude oil, but “All is not well”. To extract shale gas, companies employ “fracking” or “hydraulic fracturing” process. They inject a mixture of water, chemicals and sands into the well at very high pressure. 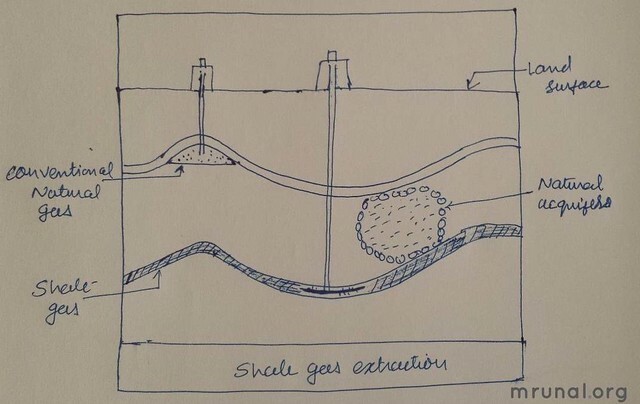 This creates numerous cracks in the shale rocks and thus entrapped gas is released. After this process is over, Water is pumped back but it has many chemical residues and dissolved solid that pose grave environmental danger to soil fertility and aquifers. Obviously, it has to be treated before being released. But that’d raise the cost of production. Given the massive amount of water necessary in fracking, it cannot be met through rainwater harvesting alone and if we utilize ground water, it may create scarcity of water for drinking and irrigation. Shale gas drilling requires way bigger sized land than natural gas or coal bed methane. Minimum 80-160 acres necessary but present shale gas policy is silent over the issue of Land acquisition and rehabilitation of people. Guar gum is used in the “fracking” process, to improve the viscosity of water. However, given the boom in US shale industry, the prices of guar gum have skyrocketed. When accounted into production cost, the shale gas doesn’t appear that cheap compared to coal bed methane, which is both cheap, available at shallow depths and doesn’t require massive amount of water or land for extraction. Given this moderate availability of shale gas, at present we are better off extracting CBM. Therefore, given above issues, Shalegas extraction doesn’t appear high on the agenda. Shale gas is extracted through “fracking” or “hydraulic fracturing” process, that requires millions of gallons of water. After process is over, water is pumped back but it’s full of carcinogenic chemical and residues that pose grave thread to environment. Its treatment would raise cost of production. Given the scarcity of water even for drinking and irrigation, its diversion for fracking would create further socio-economic problems. Its Drilling requires more land than natural gas or coal bed methane. Minimum 80-160 acres necessary for each well. But Land acquisition and rehabilitation of people will be difficult, particularly in those fertile river basins of North and South India. Compared to Coal bed methane (CBM), our shale gas reserves are moderate. CBM is cheap, available at shallow depths and doesn’t require massive amount of water or land for extraction. Guar gum is used in “fracking” process, to improve viscosity of water. However, given the boom in US shale industry, guar gum prices have skyrocketed. When all these factors are accounted in cost:Benfit, Shale gas doesn’t appear that cheap- environmentally OR economically under the present circumstances, hence not in the high priority policy agenda. (Geo Optional 1998) Bring out the present day position of exploitation and processing of nuclear minerals in India. (GS Mains 1989) Name the minerals used in generating nuclear energy and the places where they are found in India. India Yearbook Ch.25 on Sci-Tech. for theory + Indian locations. I’ve deliberately ignore plutonium, lithium etc. because then one would need to even mention their “location”. It’s hard enough even to recall uranium and thorium locations in real life exam hall. Indian Nuclear power program has three stage, first stage requires Uranium, second stage- creates plutonium from Uranium and third stage requires thorium. Therefore, among all the radioactive elements- uranium and Thorium are the most critical for generation of Nuclear Energy. Andhra: Tummalapalle in Kadapa District, one of the largest uranium reserves in the world. Uranium Corporation of India has also initiated projects to exploit this mineral from Lambapur Andhra and Domiasiat in Meghalaya. Efforts are made to explore sources in Andhra Pradesh (Tumalapalle) and Karnataka (Gogi) as well. Worldwide the leading producers are Australia (Port Darwin, Rum Jungle), Canada (Lake Great Bear), Russia (South of Urals), Kazakhstan, Namibia, Niger and Uzbekistan. As compared to uranium, the geographical distribution of thorium is much more restrictive. Largest deposits found in Malabar coast of Kerala. Sufficient to generate 3.5 lakh MW energy for 300 years. USA (Florida, Idaho) and South Africa (Coastal areas) are among other important regions for Thorium. moving to next category of questions. sugar accounts for only ~10% of the bulky sugarcane and therefore it is prohibitively expensive to transport sugarcane over long-distance in its original form. Mills have to open year around as their furnaces take time to heat up. UP, Bihar – ie. Northern plains Kaveri basin, centre and south Maharashtra. Poor irrigation facility and flooding condition. face fog, chill and frost during winters and ‘loo’ in summer. uniform temperature year around- due to proximity to equator. can work all around year. Migrant laborers from Odisha, Bengal available. Land locked areas, weak transportation facilities. Increasing disease proneness of sugarcane in the northern region has also contributed to southward shift in Sugarbelt. Rattoning technology developed by Research insti. @Coimbatore(TN). This research institute was established here due to best climatic condition for the sugarcane cultivation. UP And Bihar face fog, loo, frost and flood like conditions, While Southern States have Uniform temperature and irrigation facilities throughout the year. Coastal tropical condition and moderating effect of Ocean leads to higher sugar yields, longer crushing season – enabling mills to work throughout the year. Increasing disease proneness of sugarcane in the traditional sugar belt in northern region. 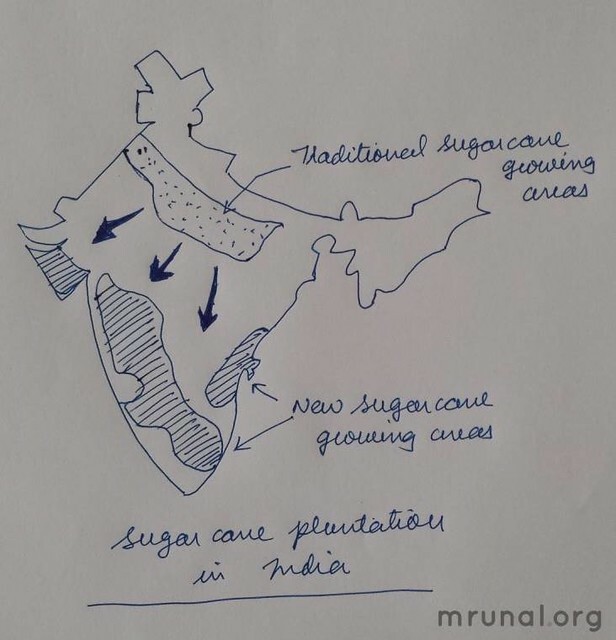 Sugar mills have be to setup near cultivation areas because (i) bulky & weight-losing nature of raw material (ii) Sucrose content rapidly declines with time. Therefore, as sugar cultivation belt started moving southwards, the mills followed them. Addition “pull” factors are (i) Labourers less unionized than Northern Counterparts (ii) Proximity to Ports at Chennai and Kochi creates additional opportunities for export. Question has been asked in Geography optional 1979, 1982, 1985, 1996, 1999 and 2000. Traditionally Maharashtra and Gujarat were the main areas for cotton cultivation & textile industries. But Cotton as a raw material=lightweight, non-perishable. Therefore, proximity to raw material site=not essential, doesn’t offer great cost-saving in transportation, unlike sugar, cement or steel industry. With expansion of irrigation facility across India, the cotton growing area has also expanded. Gradually industry shifted towards small towns and cities, with growth of handlooms and power loom industry. This industry require little capital and labour compared to mills. They can be set up easily wherever raw material can be transported- be it Jaipur, Jodhpur, Indore or Amritsar. Traditionally, cotton industry in India is largely concentrated in cotton growing areas of peninsula, Like Gujarat, Maharastra and Tamil Nadu. These areas had advantages of proximity of market, capital facility, cheap labour and proximity to port facility. But cotton is lightweight, non-perishable material, there is hardly any weightloss during production. As a result, proximity to raw material becomes non-critical factor in location. Production can be carried out anywhere with cheap labour, energy and water supply is available for dyeing. Gradually industry shifted towards small towns and cities – be it Jaipur, Jodhpur, Indore or Amritsar. As per http://pib.nic.in/feature/feyr2000/fjan2000/f210120001.html , “decentralised” means, handloom and power loom sector within textile. Geography of India, R.C.Tiwari chapter 20: Textile industries; one sub- topic named “competition from decentralised sector” (pg no.611, 5th edition, Prayag Pustak Bhawan) which also suggest same meaning from above. Historic reasons: India has been hub of handloom textile since ancient times- families pursing this profession for many generations. Govt. Incentives: Handloom industry considered highly labor-intensive, beneficial to village economy and women empowerment. Therefore government aids them with measures such as Integrated Village Handloom Development scheme and National Silk Yarn Scheme. Economic Reasons: Less Capital-intensive, requires small machinery, can be setup even at household level. Govt. Incentives: Given their role in employment generation, government aids them under TUFS (Technology Up gradation Fund Scheme), Power loom Service Centres, Workers Insurance Scheme and variety of export incentives. THE END of Geography answerkey under GS1. Remaining will be published soon. Visit Mrunal.org/Geography for more, especially world geography. loved the hand drawn maps!! appreciate your help! Sir…but what about other remaining questions of paper. How to deal with them too. i have covered ncert …………………… is there need for any other book for geography??? same here i also covered ncert . is there need for any other book for geography in mains gs?? ?plz rply….. I could not find the question related to cotton textile in optional paper (2000). please upload answer key for the other general studies paper with suggested books. you are requested to write details answer like this to the Geography Mains optional also. I am very appreciate you sir for your immence effort. sir i am not able to find a gòod article on coalbed methane. can you please help me for it? sir…plz.tell me the answer of this question.. why did the traditional cotton industry in India receive a set back during colonial period..